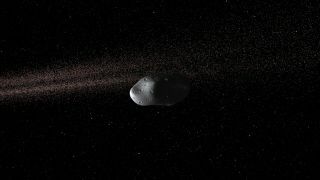 A near-Earth asteroid is depicted in this artist's impression. A small asteroid the size of a bus will pass harmlessly between Earth and the moon's orbit today (Feb. 2), only a couple days after astronomers first discovered the object. It's one of many small asteroids that have recently sped past the planet, and one of three flying by today, according to NASA (the other two will be much further from Earth). The near-Earth asteroid, called 2017 BS32, was first spotted on Jan. 30, and it follows on the heels of three other notable small asteroid flybys, the first of which passed Earth on Jan. 9. Slooh will offer a live webcast of 2017 BS32 starting at 3 p.m. EST (2000 GMT) on Jan. 2, and can be watched on the Slooh website. The broadcast will also be available here on Space.com, courtesy of Slooh. "It raises a few eyebrows when we see a number of close-approaching NEAs [near-Earth asteroids] over such a short period of time," Slooh astronomer Paul Cox said in the statement. "We'll investigate how this could be." During today's Slooh webcast, viewers can ask questions by tweeting the Slooh team @Slooh or in the comments of the events live chat on Facebook. Along with 2017 BS32, two other asteroids will fly by Earth today, much further away, according to NASA's Asteroid Watch tracker — one 1.3 million miles away (2.1 million km) and one 2.5 million miles away (4 million km). Such flybys are relatively common, NASA scientists have said. Astronomers from the Panoramic Survey Telescope & Rapid Response System (Pan-STARRS) discovered asteroid 2017 BS32 on Monday (Jan. 30). It follows closely behind another asteroid, called 2017 BH30, that came within 32,200 miles (51,820 kilometers) of Earth on Sunday (Jan. 29). That small asteroid was about 19 feet (5.8 meters) wide and flew past the planet only hours after astronomers first detected the object. Another asteroid, 2017 AG13, flew by Earth on Jan. 9 at 7:47 a.m. EST (1247 GMT), and it was followed by 2017 BX, nicknamed "Rerun," which flew by on Jan. 24 at 11:54 p.m. EST (0454 Jan. 25 GMT). 2017 AG13 was discovered on Jan. 7, only two days before it made its closest approach to Earth, and Rerun was discovered four days before its closest approach. As 2017 BS32 makes its close approach, Slooh astronomers will examine the object's size and speed. They will also discuss why smaller asteroids like this one are often discovered so late in the game, with only a few days or hours warning before they make their closest approach of Earth.